This is my final contribution as Director of the Gallery, as I retire at the end of September this year. In reflecting on my many years’ service to the Tatham Art Gallery, I realise that the part of Director on this particular stage is complex and multifaceted. It ranges across all functional areas of an art museum: collection, curatorship, research, display, education, governance, and administration. Fortunately, in my time as Director I have been assisted by dedicated staff members who have worked hard tomake the Gallery a centre of excellence. I thank you all. The Tatham Art Gallery belongs to, and is funded primarily by, the Msunduzi Municipality. In 1994 a Trust was established by which the Municipality invested a knowledgeable and interested Board of Trustees with certain management and administrative responsibilities, including acquisitions to the permanent collection. I have no doubt that the Board has made a difference and am truly grateful for its support. The Friends of the Tatham Art Gallery (FOTAG), established in 1979, is another valuable and culturally active network of talented volunteers that raise extra funding for purchasing works of art. Some of their functions include music concerts, quiz evenings and the annual Fabulous Picture Show. In retrospect, my journey towards the Tatham Art Gallery directorship seems inevitable, and includes various roles on the world’s stage. A Fine Art degree and education diploma resulted in me teaching Art and English at Eshowe High School, and then at Maritzburg College. In 1982 I was appointed the Tatham Art Gallery’s first Education Officer, a position I held for five years. I was fortunate that my Director, Lorna Ferguson, involved her staff in many of the museum’s functional areas; in the process we gained valuable knowledge and experience. Much to Lorna’s dismay, two staff members were head-hunted in 1986 by the Johannesburg Art Gallery, including myself, to design and implement its education programmes, which post I held for some two and a half years. During this time, I completed a Master’s degree in History of Art. 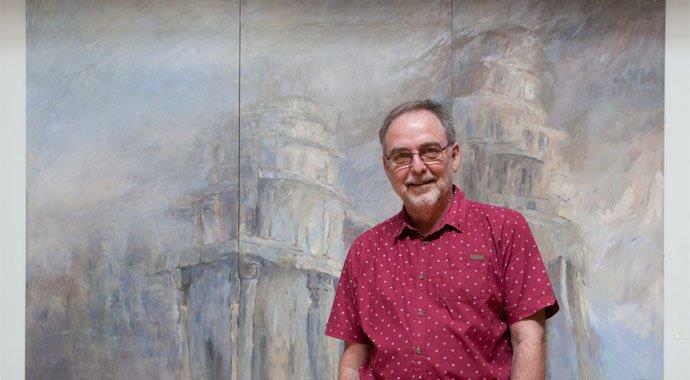 The art museum world in South Africa was a small one, with limited opportunity for advancement, and in early 1989 my wife and I took a leap of faith and joined a family pig farming business in the Eastern Cape. This was a valuable experience but the arrangement proved financially unviable. We moved back to Pietermaritzburg in 1990 where I taught again at Maritzburg College. In 1991 Lorna Ferguson resigned as Director of the Tatham Art Gallery and I was asked to apply for the post. For personal reasons I declined, but couldn’t ignore my fate when a few months later the post again became available. After twenty-seven years I have the honour of being the longest serving Director of the Gallery. At the heart of any museum is its collection. Each successive director adds his or her stamp on how the collection is consolidated and expanded, within the framework of an acquisitions policy. I have been fortunate to work with a focussed acquisitions policy devised originally by Valerie Leigh, Curator from 1967 to 1974. Our policy places emphasis on relationships between art works in the founding collection which illustrates the emergence of European Modernism, followed logically by acquisitions of works by South African artists in one way or another connected with the Modernist approach to art making during the first half of the twentieth century. Growing demands for political change gathered momentum in the 1970s and have continued to shape the transformation of South African society, including the narrative of its history and varied cultures. Art museums were challenged to make their acquisition policies inclusive. Inclusivity implies not only racial representation but breaking down barriers between traditional western notions of high art and craft, consciously embracing a fluid African aesthetic. This in turn led to accepting that traditional material cultural artefacts such as Zulu clay vessels and beadwork could no longer be marginalised as items of material culture only. Their inclusion in art museum collections has immeasurably enriched both the Gallery’s and South Africa’s heritage. The Gallery’s inclusive acquisitions policy has in turn influenced how we display art works from the permanent collection. Our intention is to create conversations between art works across cultures, geographic origin and time. These conversations lend themselves to insights which may not be apparent in more traditional displays. Researching and curating displays in this inclusive way is challenging. It takes time and requires participation of management, education and technical staff. Most importantly, it enriches and deepens our visitors' experience of the collection. Finally, I would like to reflect on three of the first acquisitions made to the Gallery’s permanent collectionin 1992 under my directorship. A Director has to provide sound reasons when motivating potential acquisitions to the collection. The decision to acquire an art work is made by the Acquisitions Committee, and ultimately approved by the Board. I have been fortunate that the Gallery’s Acquisitions Committee and the Board have seldom disagreed with art works I have presented. Frank Graham Bell was a South African born artist who was a founder member of the London-based Euston Road group which promoted a move away from avant- garde styles to a ‘realism’ derived from the work of Cézanne. In many ways Bell’s painting of Lyttleton Airfield suggests developments in European Modernism reflected in the Gallery’s core collection. One of the threads in our inclusive acquisitions policy has been how artists from different cultures view the‘other’. This etching by Willem Hermanus Coetzer is a case in point. The tondo format and mother and child subject was often used by Italian Renaissance artists. 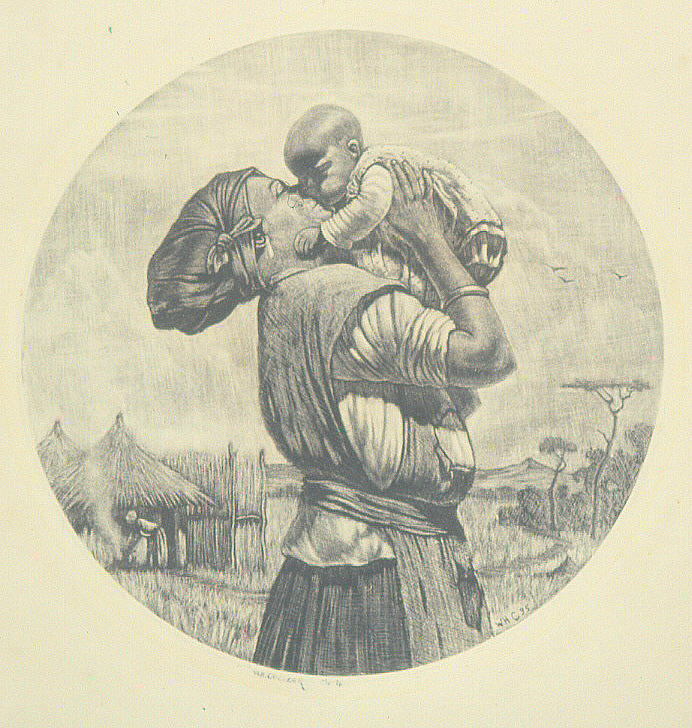 In this depiction Coetzer’s mother and child are African, set in a ‘classical’ rural South African setting. The autobiographical sculpture by Samson Mudzunga represents a shift in the Gallery’s acquisitions policy, echoing a Postmodernist reaction to the theory and practice of Modernism. Postmodernism refuses to recognize the authority of any single style or definition of what art should be. 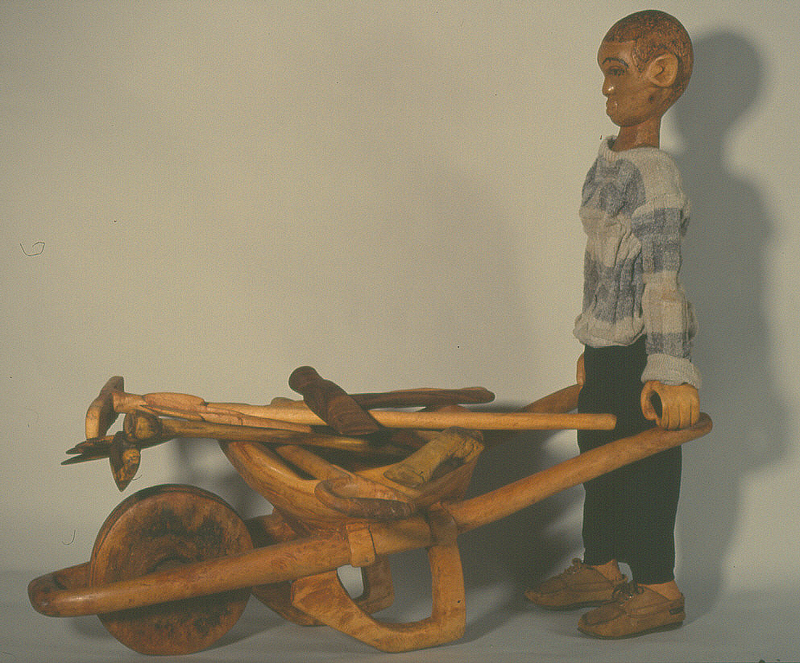 As with subsequent acquisitions to the Gallery’s permanent collection, Mudzunga’s Wheelbarrow challenges us to reflect on our perceptions and prejudices about the role and function of art in society. My ‘part’ has been to add value to the Gallery’s permanent collection, and its exhibition and education programmes. I am very proud of what the Gallery has achieved during my tenure as Director. This has only been possible with the supportive roles of so many who have made their exits and their entrances on and off this particular stage. For some time there has been discussion about the possibility of acquiring a new piano for concerts at the Gallery. The Steinway Boudoir grand piano was purchased by the Friends of the Tatham Art Gallery during conversion of the Old Supreme Court building in the late 1980s. Few of you will know that a secure storage space off the Lorna Ferguson Room was included in the design. The piano is now an asset of the Tatham Art Gallery Board. The Steinway is over seventy years old, and professional examination has revealed that previous renovations were questionable. It would require a total rebuild, at great expense, to improve its performance capabilities. Late last year the Board decided to acquire a brand new concert piano, using the Steinway as a trade- in. A very generous deal was concluded with Ian Burgess-Simpson Pianos in Cape Town. The outcome is that the Gallery will, in the near future, have a new Shigeru Kawai SK3L for concerts. The SK3L excels with an extraordinary blend of superb tone and touch that has been admired by professional pianists across the globe, including our pianist-in-residence, Christopher Duigan. Steady progress is being made with restoring the four hundred art works damaged in last yearís flood. To date work on thirty six paintings and thirty art works on paper has been completed. Although the restoration process is slow, results can be spectacular. 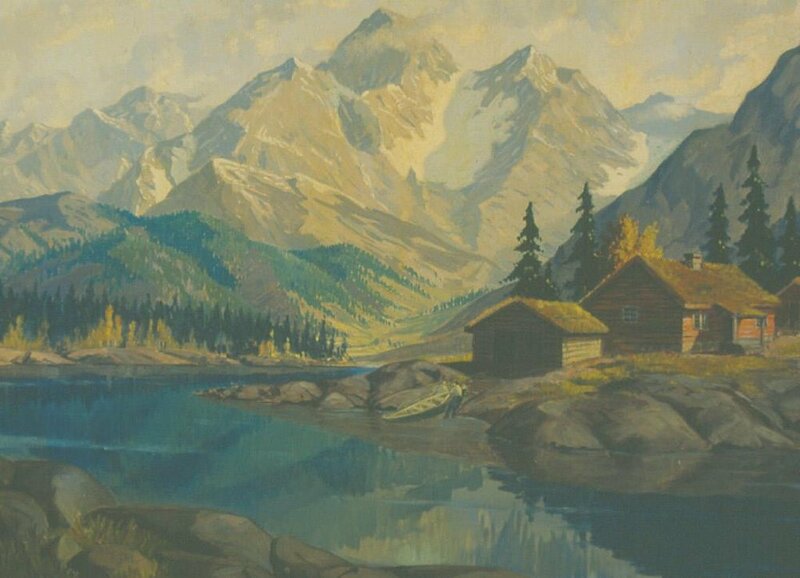 Below are two images of Nils Andersenís Swiss Landscape, painted in 1972. Simply removing the old, yellowed varnish and applying a new, clear layer has made an astonishing difference. At our Annual General Meeting in November last year we bade farewell to Professor Terence King as Vice-Chairman of the Tatham Art Gallery Board of Trustees and Chairman of the Board’s Acquisitions Committee. He has been involved in one way or another with the Gallery for over 32 years. We wish him and his wife, Pam, many happy years of closer contact with family in Johannesburg. Christopher Duigan was elected Vice Chair for the coming year. The Gallery has always had strong historical ties with the Centre for Visual Art (CVA) at the University of KwaZulu-Natal. We welcome Dr Louise Hall of the CVA as a new Board member. We are making good progress with restoration of art works affected by the flood in May last year. It is fortunate that no paintings were deemed irreparable. Seven art works on paper were declared irreparable: pen and ink drawings by Carola Brotherton; koki drawings by Derrick Nxumalo and Philane Nzimande; and a mixed media drawing by Elijah Radebe. Fortunately we have similar works in the collection. The image below shows the devastating effect of water on drawings made with koki pen. The vibrant colour is simply washed out. There is no way a restorer could recreate the lost areas to match the original. The main exhibition room will only be available for temporary exhibitions from the end of March. It is currently used as our painting restoration studio. Despite this we have five temporary exhibitions opening between January and April. Our first temporary exhibition of the year honours Dr Valerie Leigh, curator of the Gallery from 1967 to 1974. This exhibition presents Valerie’s own work in the permanent collection. This is followed by the Maritzburg Philatelic Society’s award-winning display of stamps and other memorabilia focusing on the history of Pietermaritzburg. Five Degrees of Realism showcases the work of five local artists, and a new display in the Ceramics Room juxtaposes different containers for holding liquids. The first exhibition in the main exhibition room is a solo show by Beth Diane Armstrong, Standard Bank Young Artist award winner for visual art in 2017. The Gallery continues to provide visual arts programmes within the community. A very successful mandala workshop was run for the Pietermaritzburg Mental Health Society late last year.